I’m teaching myself about plants. 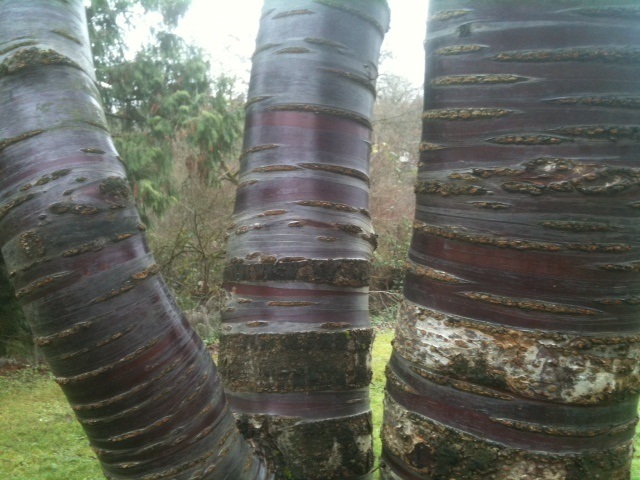 Last week, my dad and I traipsed through the Washington Arboretum, in search of its Winter Garden. It is not a garden to rush through – anything faster than a stroll and you’ll miss it. The colors are not flashy – no effusive bursts of pink, no huge swaths of dizzying color. But if you stand still a minute, and take a look around, you notice a few things. Paperbark Maples, losing swaths of bark, are silky brown on the outside and a luminous golden-yam on the inside. I resisted the urge to tear off a sheet. Shrubby dogwoods have slender, fiery tips, a lovely crimson in the blue hours. And, odd snowberries, Symphoricarpos albus, are white puffs afloat gray bushes. I want to say they look like yogurt-covered raisins, but that description, though accurate, seems lacking in intrigue. They’re also called ghostberries, as the waxy, spongy puffs last throughout the winter, munched on by quail and grouse and other fauna of that ilk. Some sources claim the berries (also called drupes – neat word!) are toxic to humans causing that standard nausea-dizziness-vomiting thing, while others claim that poultices of snowberries might have certain curative properties, perhaps for sore eyes. I think I’m going to stick to just admiring their small, bulbous presence, among the other odd berries of a Northwest winter, with their deep reds and juicy blue-blacks, along with the bright, rosy-orange pomes of crabapples. Incidentally, if anyone talented at dress-making wants to make me a sheath dress inspired by the bark in the photo above, I’d be a happy little elf.